This tragedy is really numbing me and a similiar reaction came from passengers last night. Most everyone was subdued and unable to describe their feelings nor comprehend the scale of the thing. Including a sombre American Express employee. He told me he'd spent the last 2 days attempting to contact their members travelling in Asia with offers of assistance. The only success he was having was with some members who had 'roaming' on their mobiles. And no contact at all from the Maldives travellers. Overall, he was getting a low contact rate and was obviously troubled by this. As Foreign Minister, Alexander Downer has warned, be prepared for more bad news. With the terrible tragedy unfolding around south Asia now, it doesn't seem important or appropiate to post regular today. I'd rather just pray. A.
UPDATE : I went to work yesterday with the death-toll at 16,000, yet arrived home at 3am to a figure nearing 60,000 ! Hence the depressed post above, which now sounds sanctimonious. I should've however referred readers to Tim Blair, who is providing a sterling and continuous coverage of the situation. Lazy is...mobloging in bed. Rather than getting off my arse and taking two steps in order to fire-up the PC. 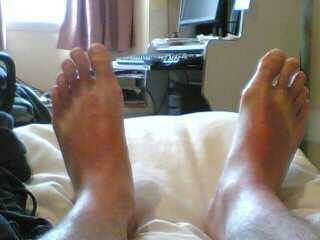 Note the cabbie suntan - yesterday's thong marks after a rare day in the sun. For anyone interested in mobloging, this post cost approx. $1 - 0.70c to send and 0.30c to check it arrived onsite. Anyway, the cricket's on the radio and I've a new book to read on sports writing. I'm not moving ! Q: Why do Europeans prefer liberals than conservatives ? 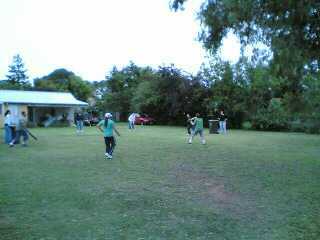 Here's a moblog - in a Bowral backyard at a Christmas Day cricket match. It was a modern day mixed bunch of players comprising 9 females and 5 males. Many star performances were exhibited, none more so than yours truly pulling off 3 blistering one-handed catches ! Two on the left, one on the right, and I have witnesses ! Happy Boxing Day. Once upon a time only economists could see the value in a low Aussie dollar. Now even cab drivers will preach to you about its benefits for Australian exports. UPDATE : Ho bloody ho ! A happy Christmas to all my readers. Remember, don't drink and think/walk/drive......just catch a cab ! Bruno Dutot regularly paints his famous lady near our place. It's always exciting around here when we notice it's changed. Does he sneak over here in the dead of the night, wearing a balaclava? We like to think so.